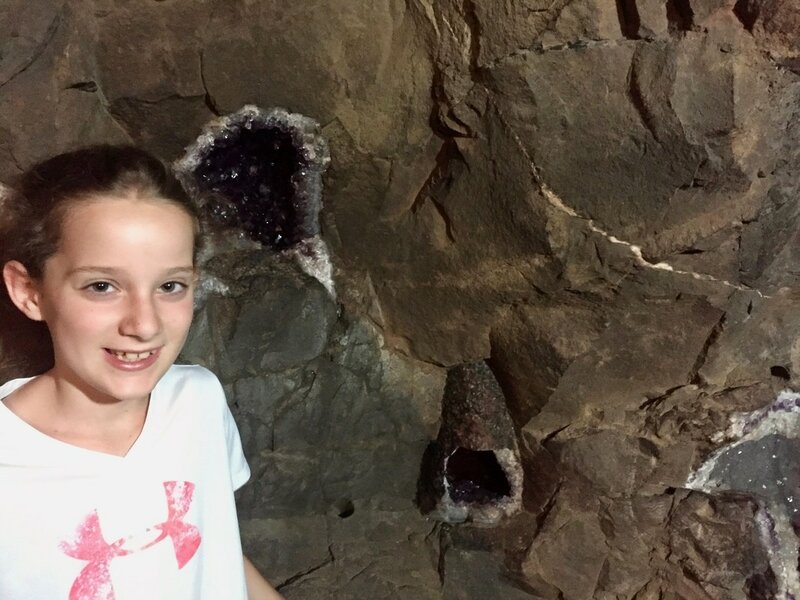 We visited a geode mine on the way to the estancia. Adios Puerto Viejo! 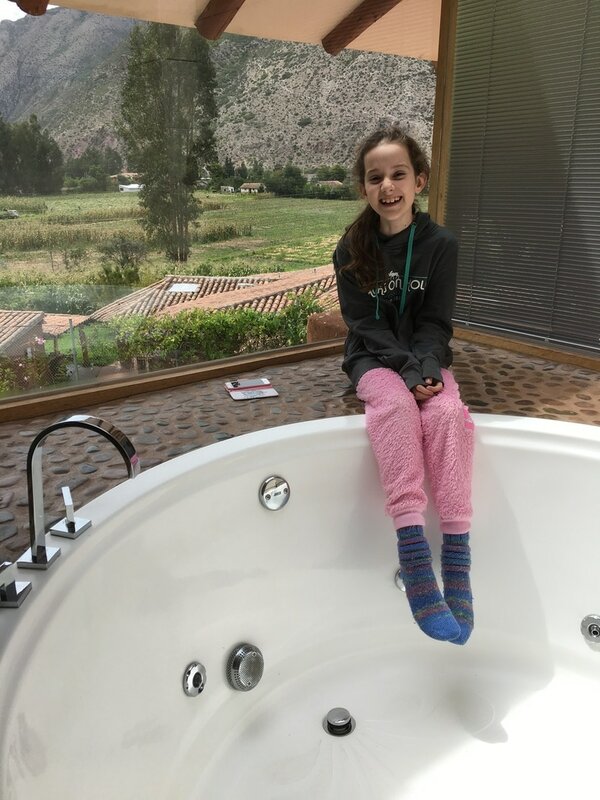 Hola Peru! 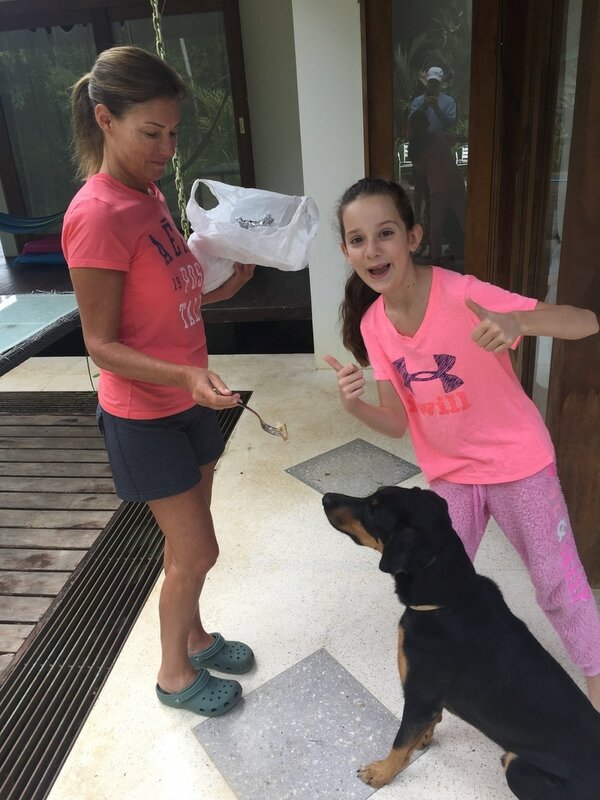 Our cute dog we named Wahoo was sad to see us go because we gave him treats and leftovers constantly. 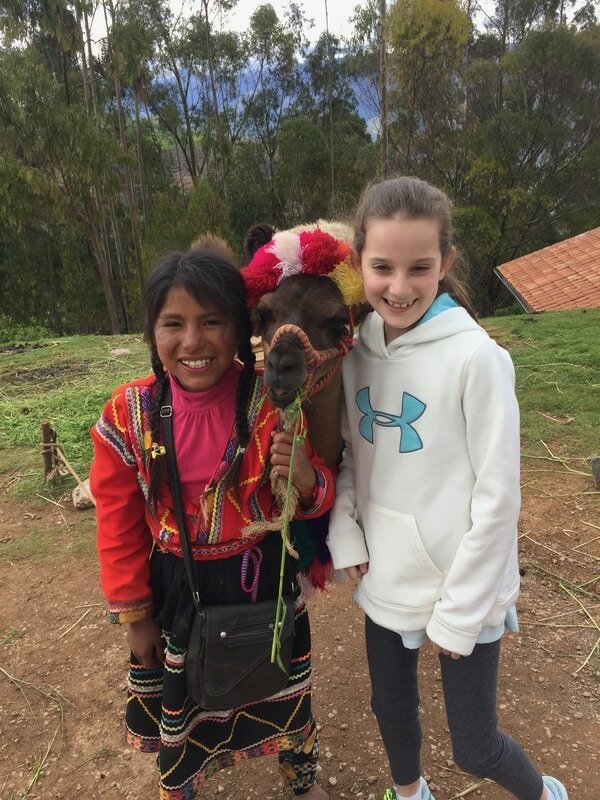 My first alpaca experience in Peru! 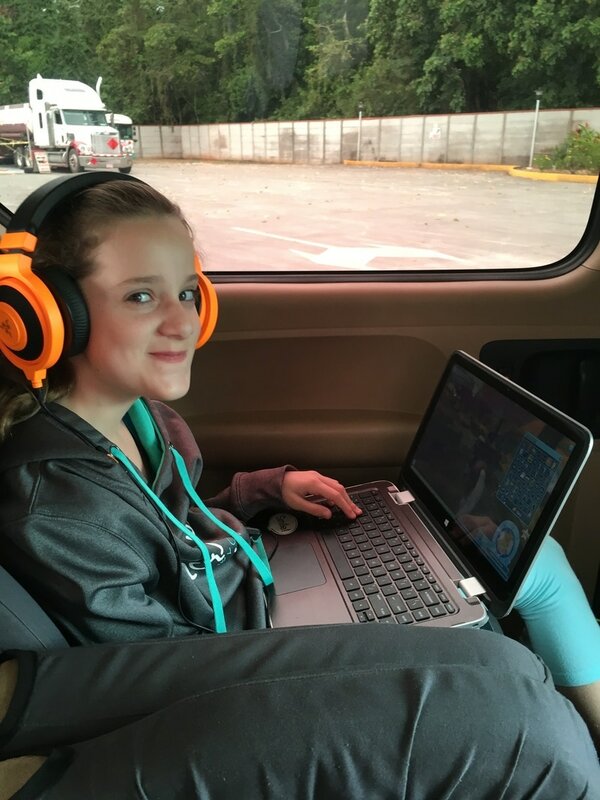 I'm so glad there was wifi in the five hour car ride to San Jose! I've never seen a Jacuzzi so big in my life! Kaiden is going to miss us as much as we will miss him! One of my favorite animals there is this deer, which roams around freely. 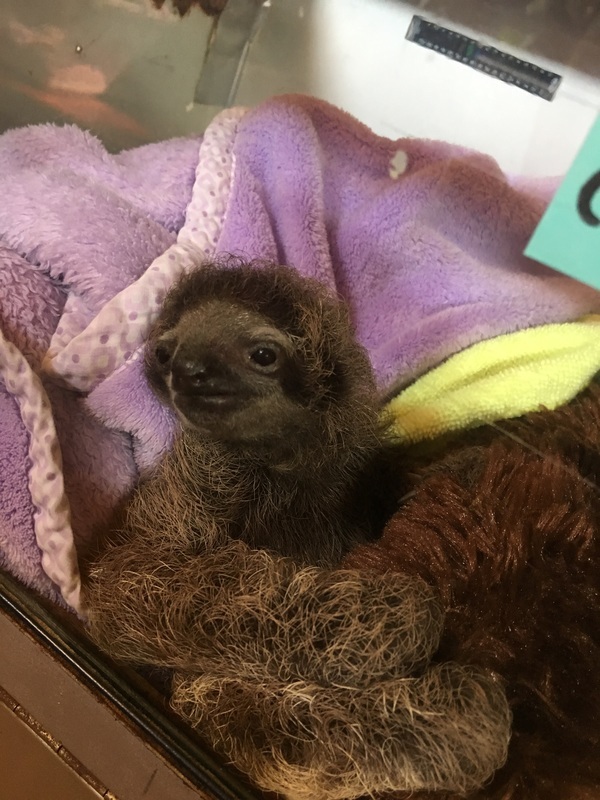 This sloth and her baby accidentally electrocuted themselves by touching power lines. This happens a lot. 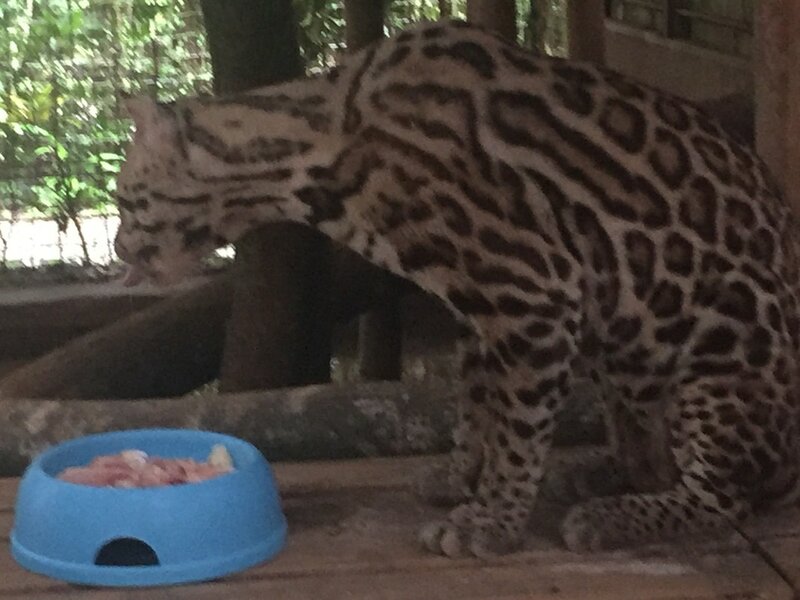 An ocelot eating his dinner. 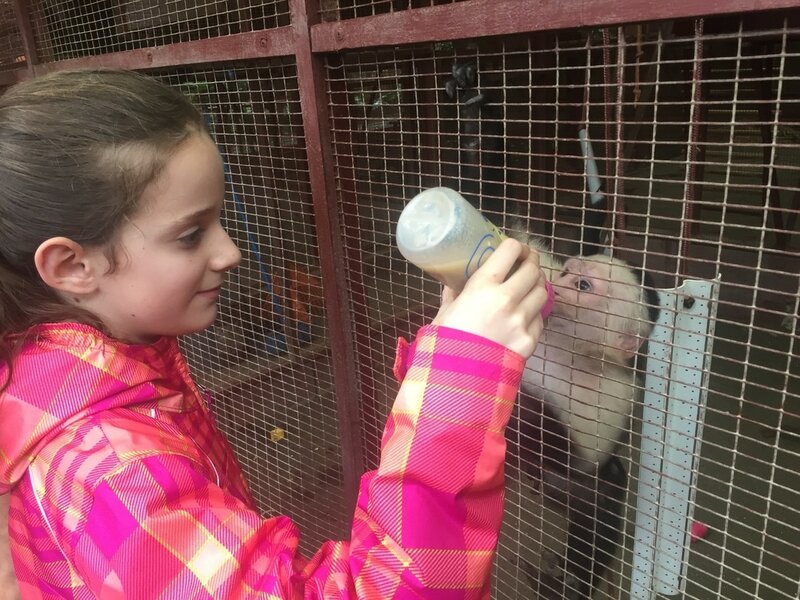 We got to feed monkeys their milk! Anton Valle was a nice place! We stayed in a big house with an indoor pool and there were some dogs and horses. A couple of the dogs loved to play fetch. One dog was obsessed. 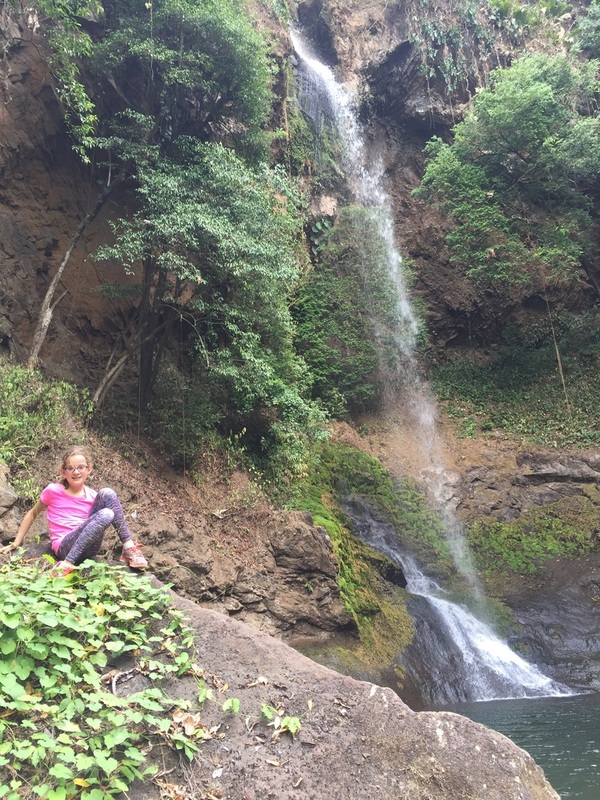 We were there a week and kept busy doing schoolwork, ​cooking and visiting a waterfall. After Anton Valle we drove to a place near Panama City. 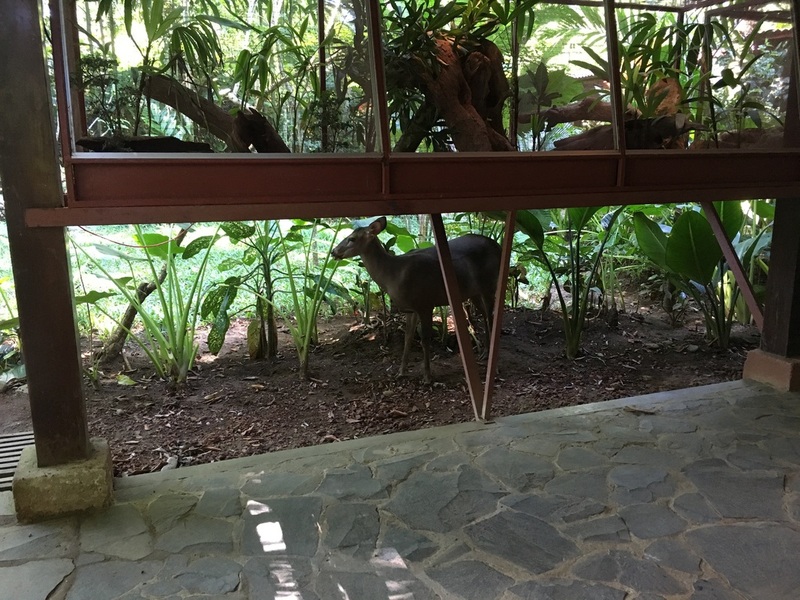 We stayed at the Gamboa Rainforest. It wasn't really a rainforest like they had in Costa Rica. It didn't feel as natural. There was a crazy, long, old, falling apart one way bridge we had to cross to get to and from the hotel. It did have a traffic light otherwise it would have been too dangerous. 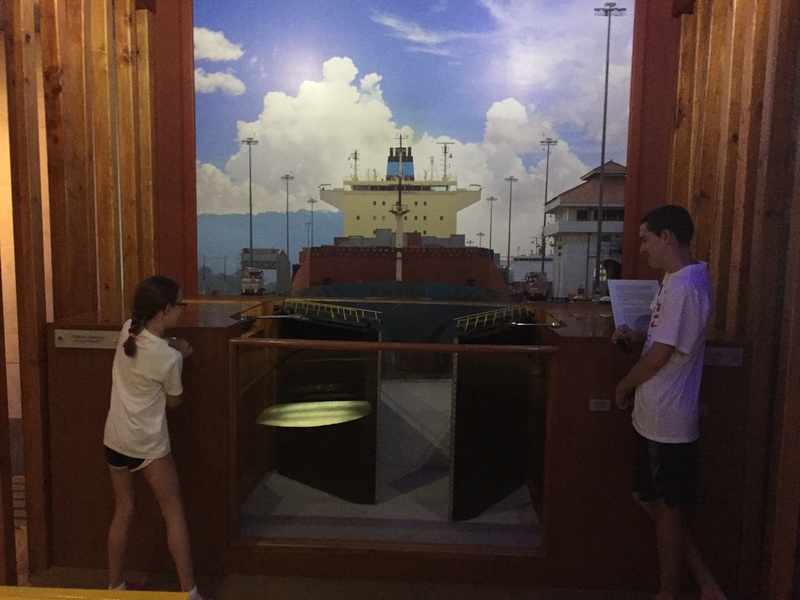 ​Our main objective was to visit the Panama Canal so we could see how it worked. We watched a 3D movie about it and visited the museum and information center. 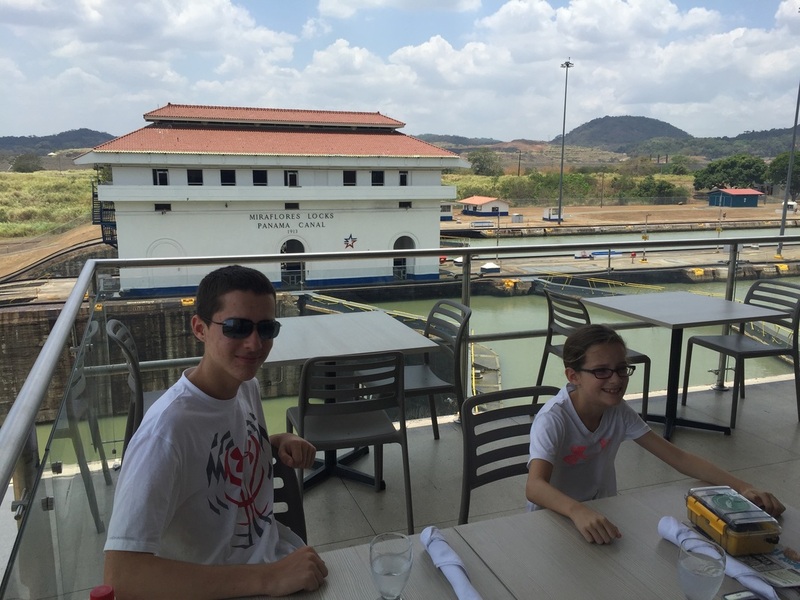 There was a restaurant there, which had a really good buffet, where you could eat and watch the boats travel through a series of locks. Unfortunately, when we were there for lunch it was when the boat traffic changed direction. In the morning the ships go from the Pacific to the Atlantic and then in the afternoon they switch. There is a gap in the middle of the day when no boats come through. So we decided to come back the next night and have dinner there. It was really amazing to see how the locks worked. 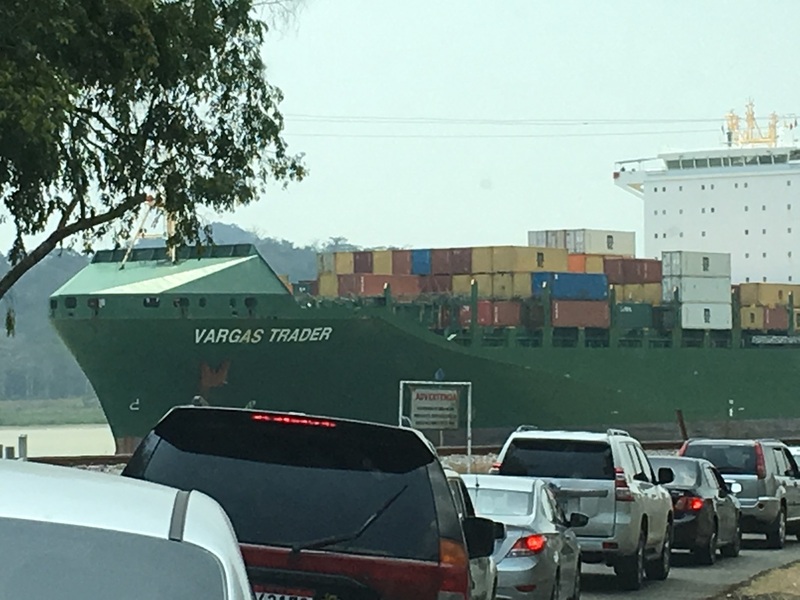 The ships were very tall and barely fit through the canal. There are trains they call mules which push and pull the ships through the locks. We are back home and I'm extremely happy to be home with my friends, my dogs, my bed, my house and, of course, my lizard! 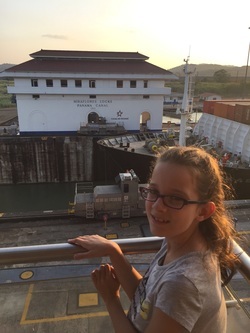 We left Puerto Viejo for Panama last week. Crossing the border was weird because we had to walk all the way across a long bridge. It was us and the locals crossing the border. It was hot and we had 14 bags and suitcases to take with us. Fortunately, there were guys there to help us carry them. On the other side of the border we had a van waiting to take us on a four hour drive to Boquete. The town on the border was called Sixaola. As we drove through we were glad we weren't staying there. We came across many banana farms as we left the area. Boquete is a mountain town. The weather was cooler and in the town there were lots of flowers. They really like their flowers. We stayed at a house on a golf course. I'm a great putter! 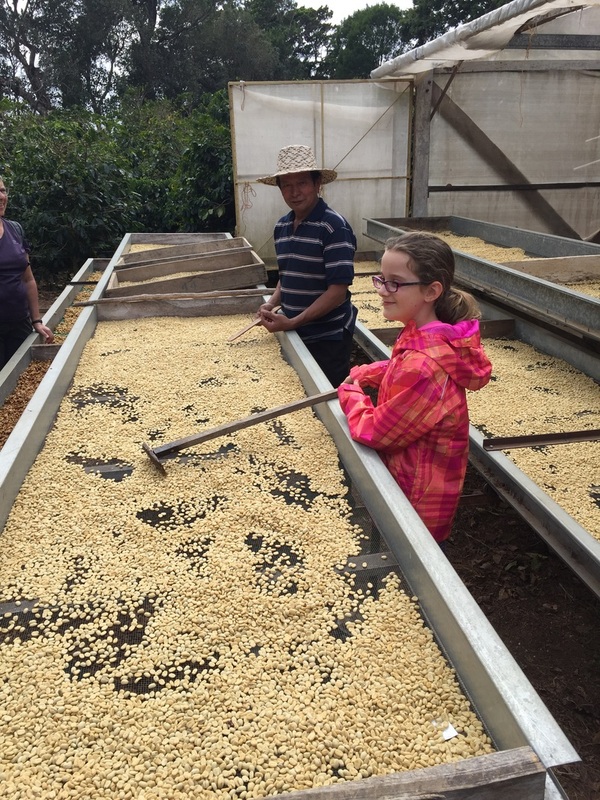 We ventured out to see a coffee plantation. 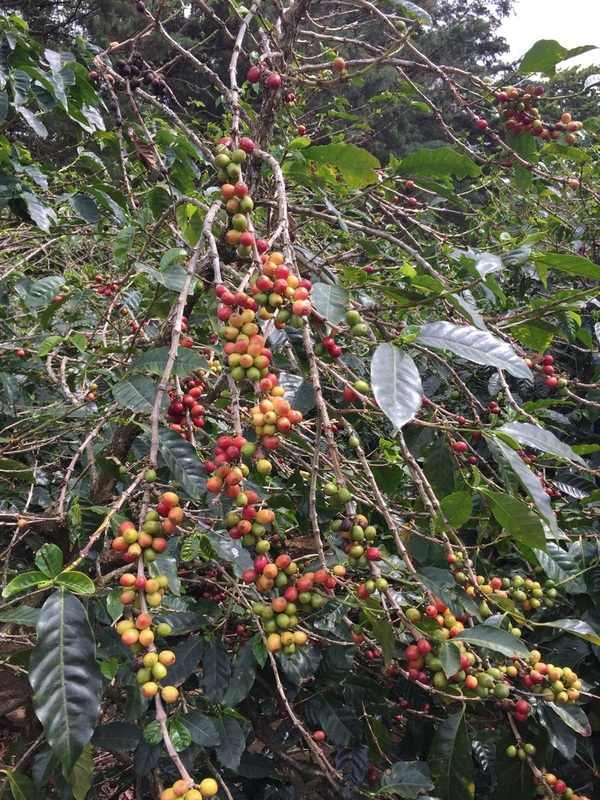 It was very interesting to see how coffee grows and to taste their coffee. From my perspective I am a coffee drinker. It wasn't a fancy facility. It was unique because Tito, the owner, built everything by himself using parts from different things, mainly old cars. We are now on an island. 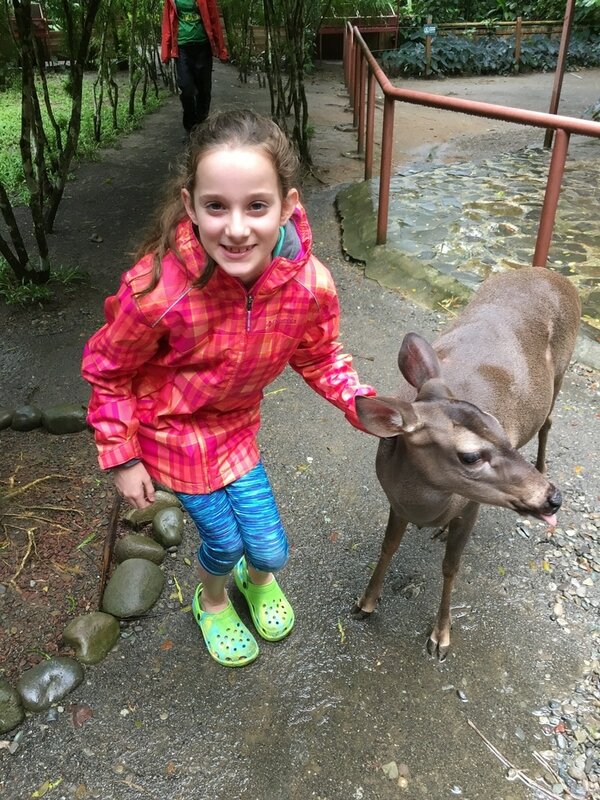 There is a lot of wildlife here. We have spotted raccoons, monkeys and birds. When we first got here it was windy and the water was rough but now it is calm as can be. I haven't had a lot of sleep because of the bad A/C and the monkey greeting at 4:00 AM in the morning! 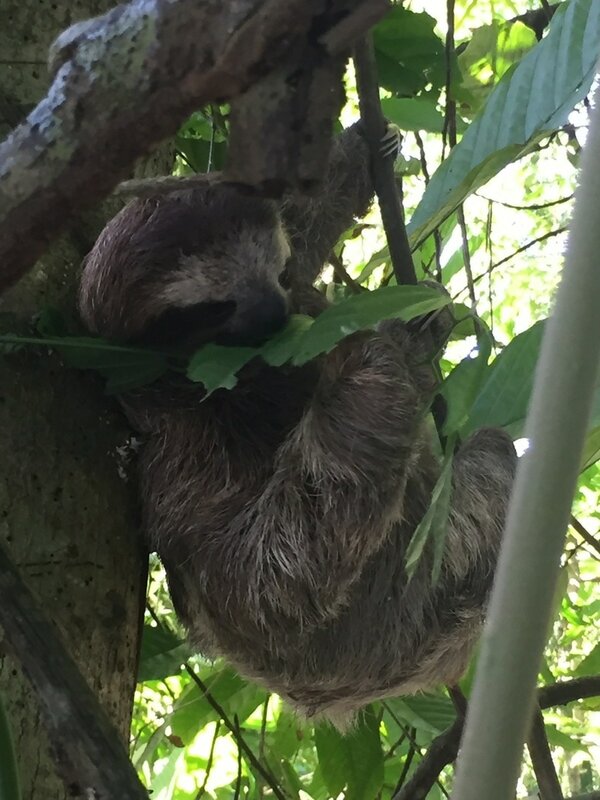 We sure have seen a lot of sloths this last week. 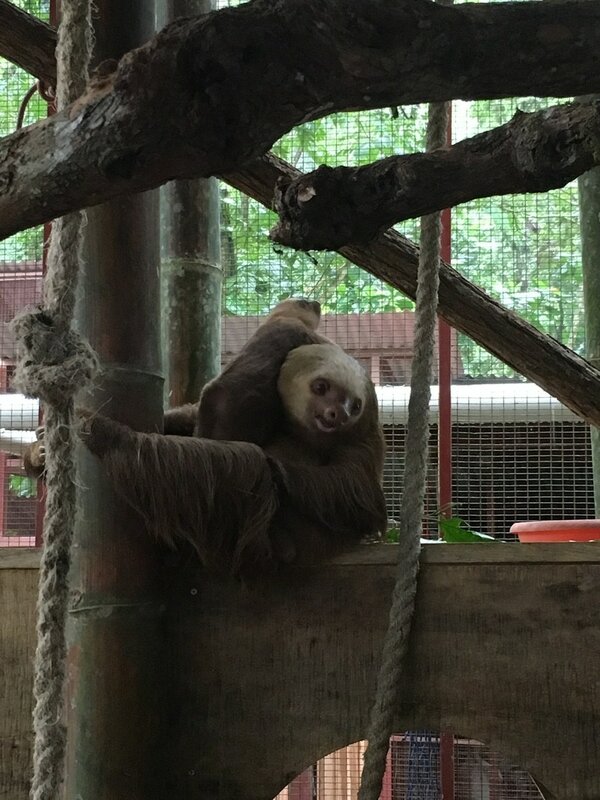 We went to the Sloth Sanctuary in Cahuita. 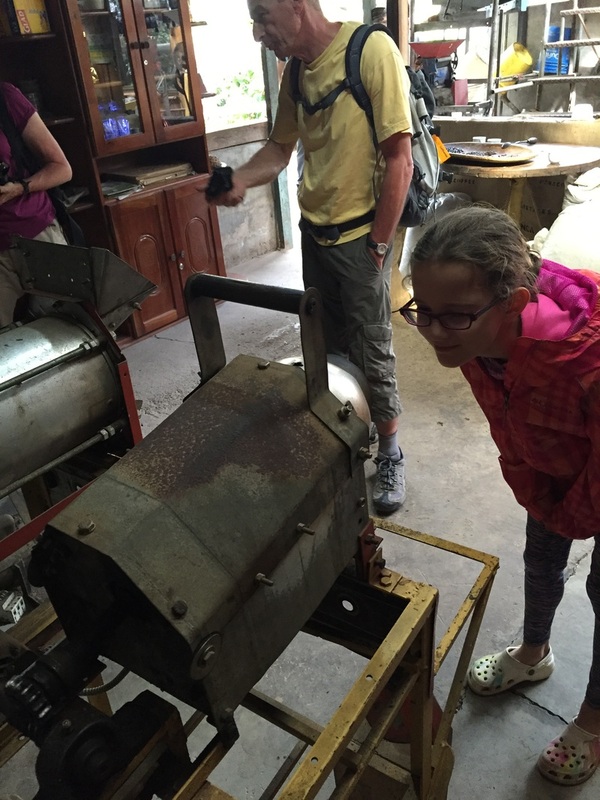 We also ventured to the Jaguar Rescue Center in Puerto Viejo. 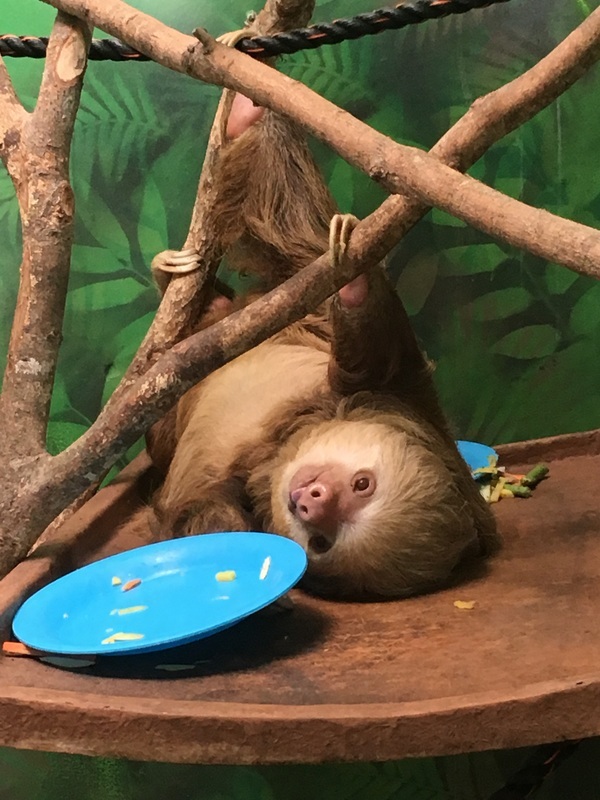 The Sloth Sanctuary has had a television show on Animal Planet. I have not seen it yet. It was a long tour. 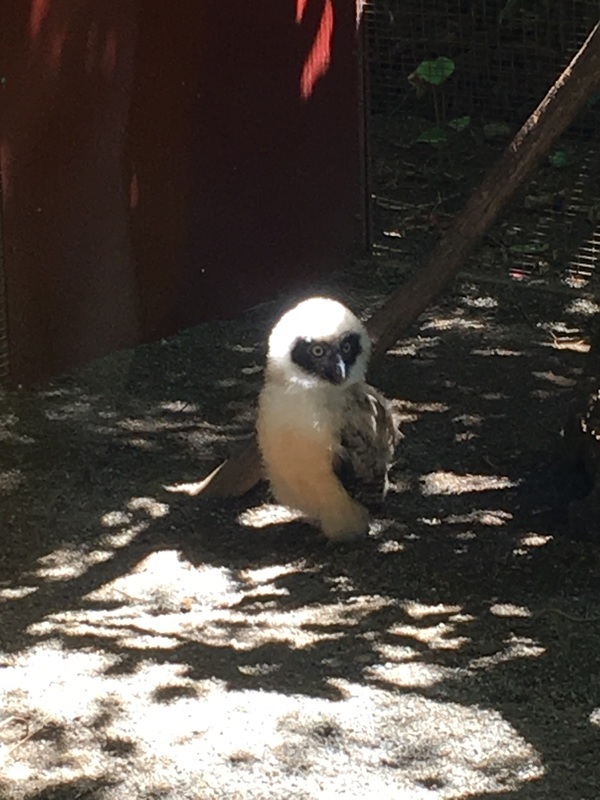 We saw and learned about adult, tiny baby and older baby sloths. 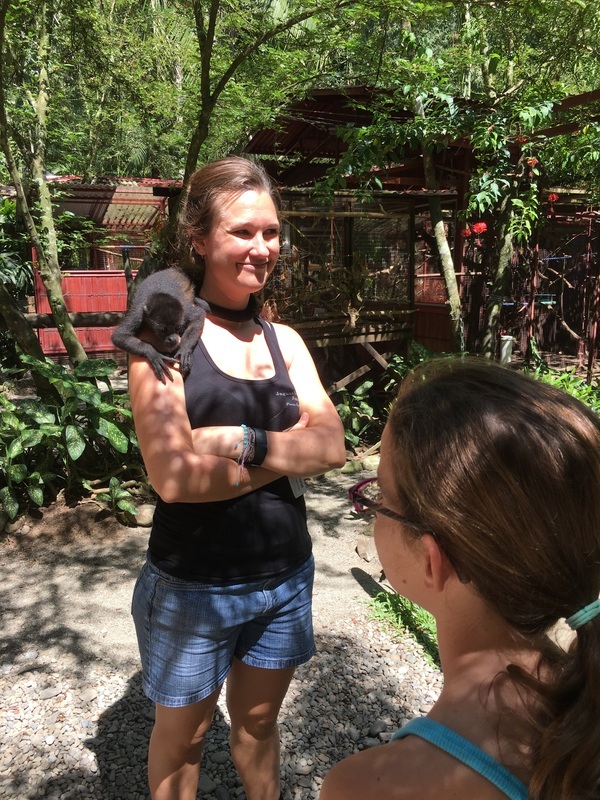 The tour included a canoe ride where we spotted howler monkeys, more sloths and learned how banana trees grow and produce fruit. 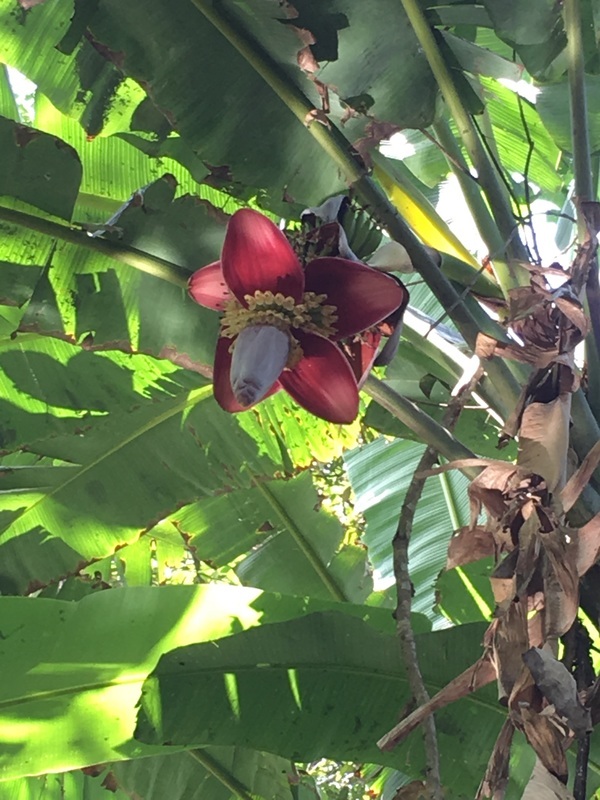 A flowering banana tree - the yellow part of the flower is going to become the fruit. The two types of sloths they have are two toed and three toed but we discovered they both have three toes! People who know a lot about sloths call them two fingered or three fingered. The two fingered is nocturnal and looks completely different from the three fingered. It has blondish fur, four sharp canine teeth used to eat unripe mangos, is bigger and cannot swim. The three fingered has the Pur A Vida smile, has course grey colored fur, only eats leaves, has no canine teeth, can swim, and is diurnal. Stevie was my favorite two toed sloth. Spirit was my favorite three toed. Spirit was less than a month old. All the babies they have are orphans. The Jaguar Rescue Center was amazing! 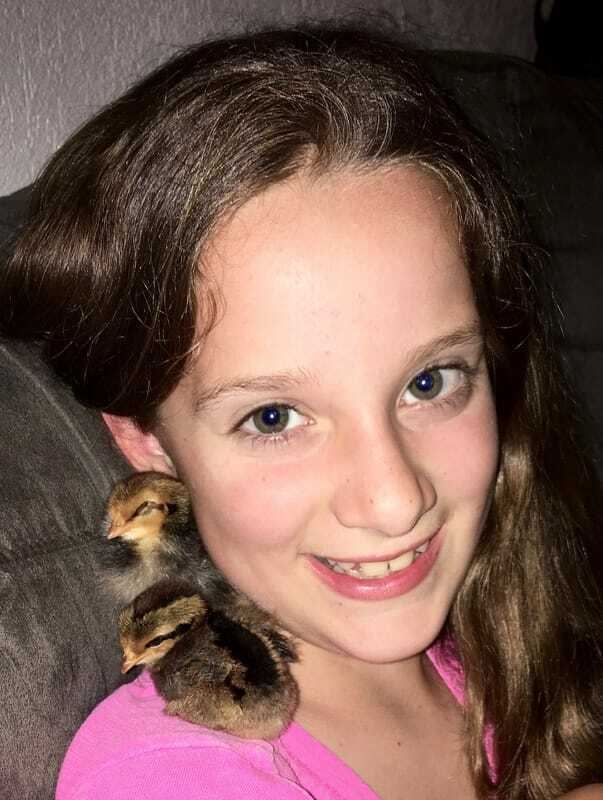 They try hard to reintroduce their animals back into the wild. They have been successful at reintroducing baby sloths. 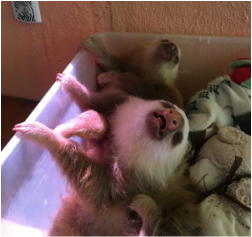 Sadly, the Sloth Sanctuary has not and they have so many babies there. 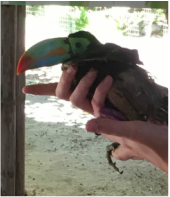 Along the tour we saw a baby keel billed toucan that was so cute! He was there because his wings had been clipped and another animal got him. They have been working with him a lot and he is getting much better. It will take two years for his feathers to grow back. 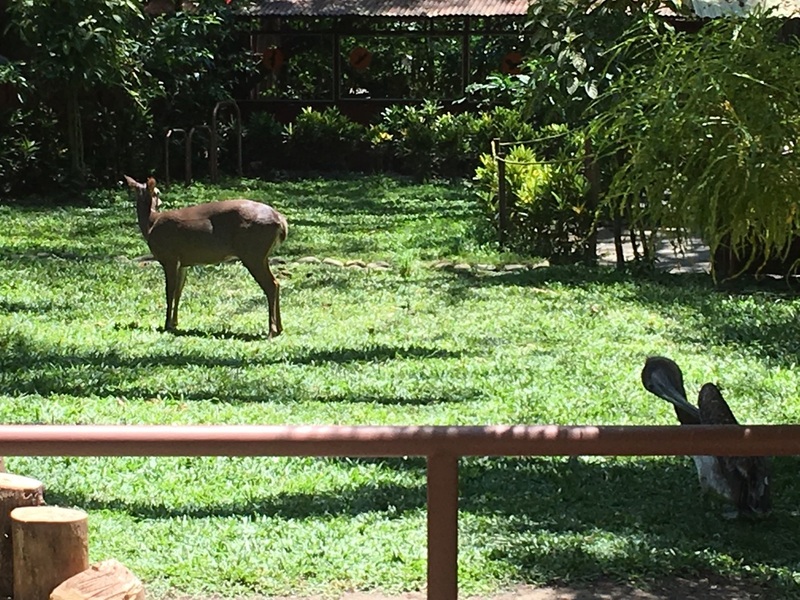 They also had a very tame deer as well as two pelicans that roamed around the gardens where we were. Pistachio was the nice pelican. He has a wing with severe ligament damage and won't be able to fly again. The other pelican was mean. We had to be careful and give him a lot of space, which was tricky because he would get in our way! He will be leaving the center soon because his wing is getting better and he is starting to fly. They said when he is ready he will just fly away. We got to see the famous Costa Rican tree frog. It was sleeping because they are nocturnal but we could still see some of its colors. 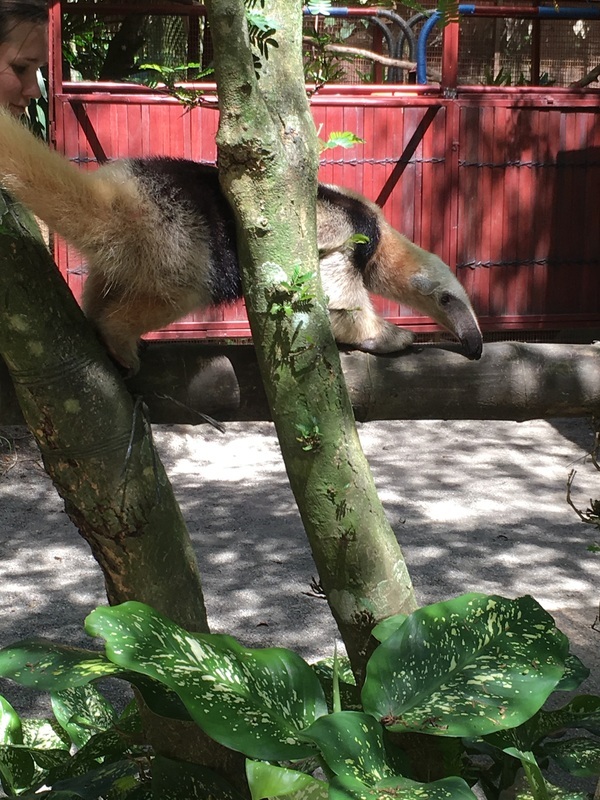 A tamarind anteater, baby howler monkeys, owls, raptors, big cats and a crocodile were all there too. I loved the Jaguar Rescue Center and want to volunteer there one day! 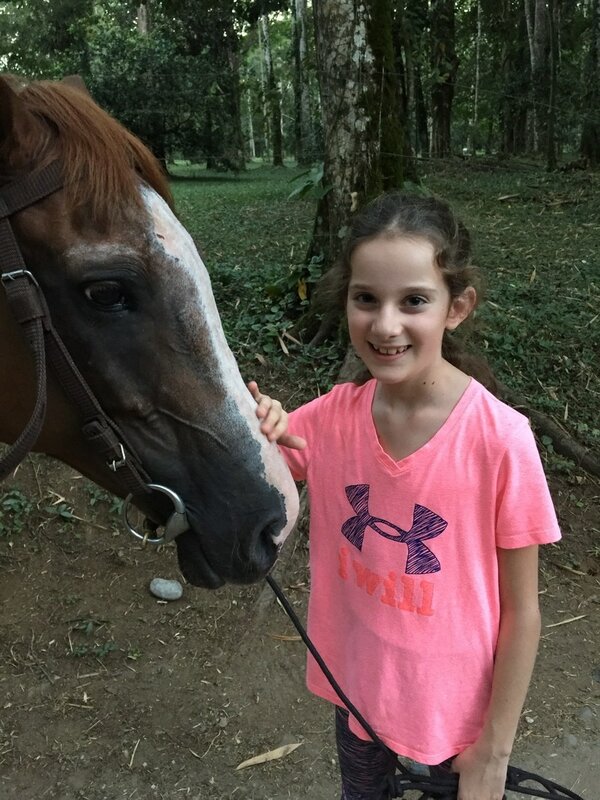 Arenal was pretty fun. While we were there we did some activities. One of the things we did was a float trip. It lasted 3 hours and was a scenic ride. Every now and then there were mini rapids. We got to dangle our feet in the water as long as we could see the bottom and if we weren't in a crocodile area. It was hot and the water felt good! We saw a snake, a few iguanas, a lot of howler monkeys, crocodiles, bats, baby owls that were in a cave nest, and lots of different kinds of birds. There was a special kind of bat that would work together in a group. They sleep on the side of a tree all lined up. Their camoflauge is to look like a crack in the tree. 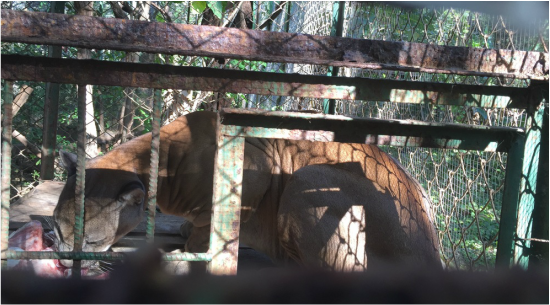 After the raft trip we went to a puma rescue center. All of the animals there have been injured and can't live in the wild. 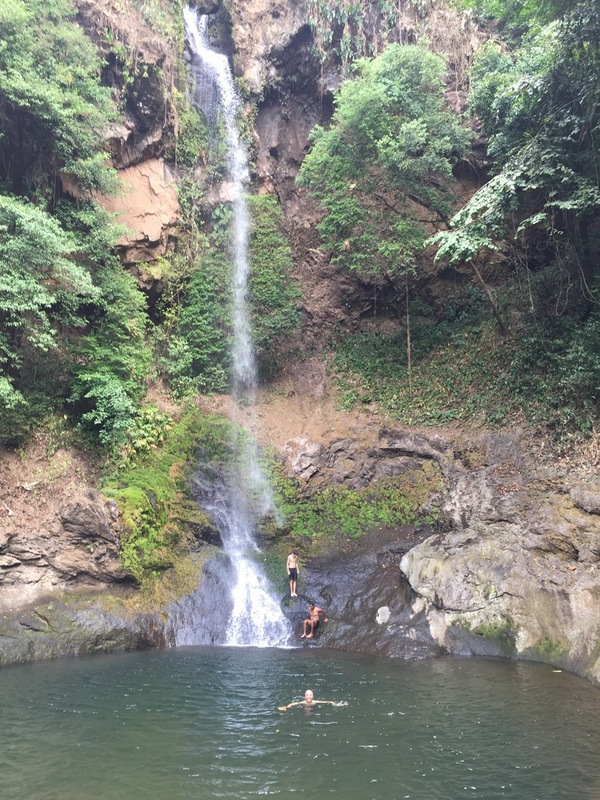 There were pumas, a jaguar, an ocelot, spider monkeys, an otter and some other different cats of Costa Rica. A big puma eating dinner! We left Arenal and drove 6 hours to the Caribbean side of the country. 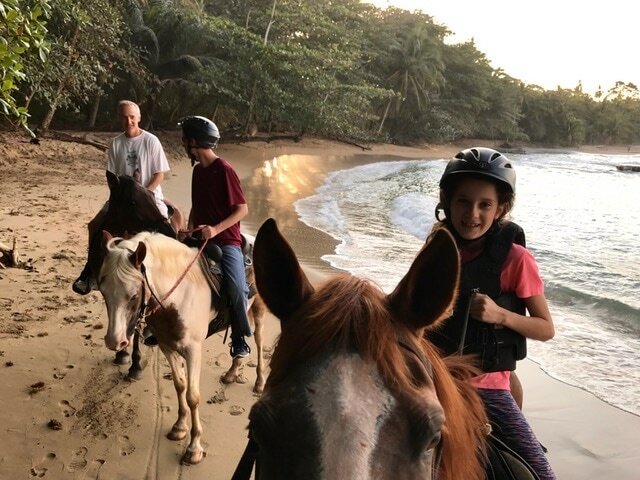 We are in a town called Puerto Viejo which is very close to Panama. 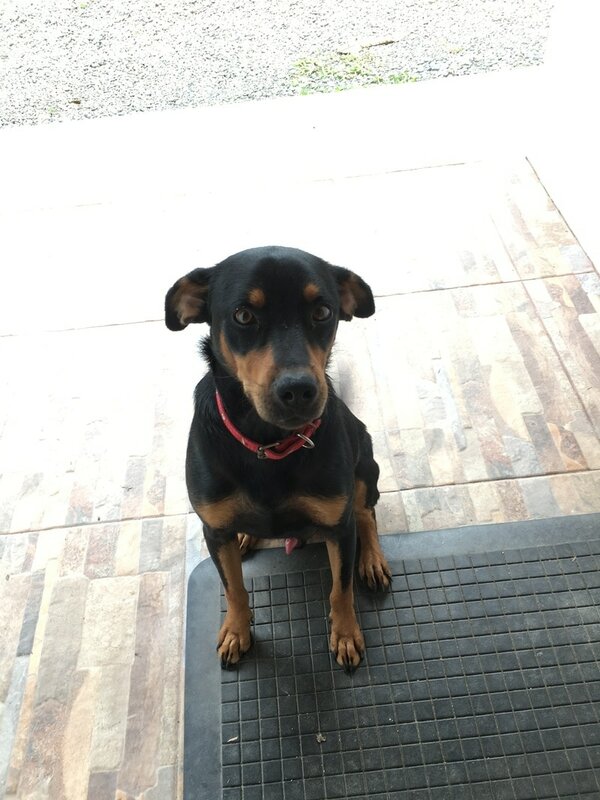 The house is nice and we have 3 neighboring dogs that we give treats to. They are very well behaved. Yesterday when we went on a walk we saw a lot of things. 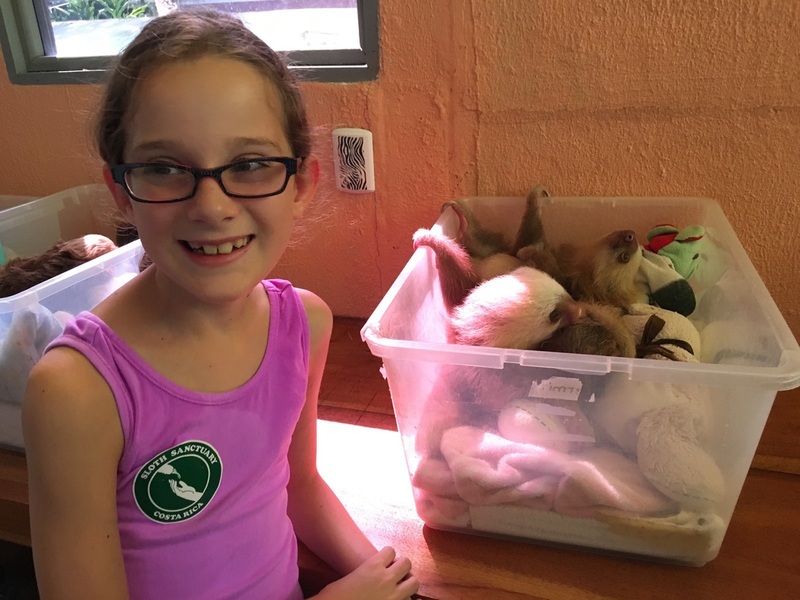 We saw geckos, hermit crabs, big crabs and last but not least sloths! 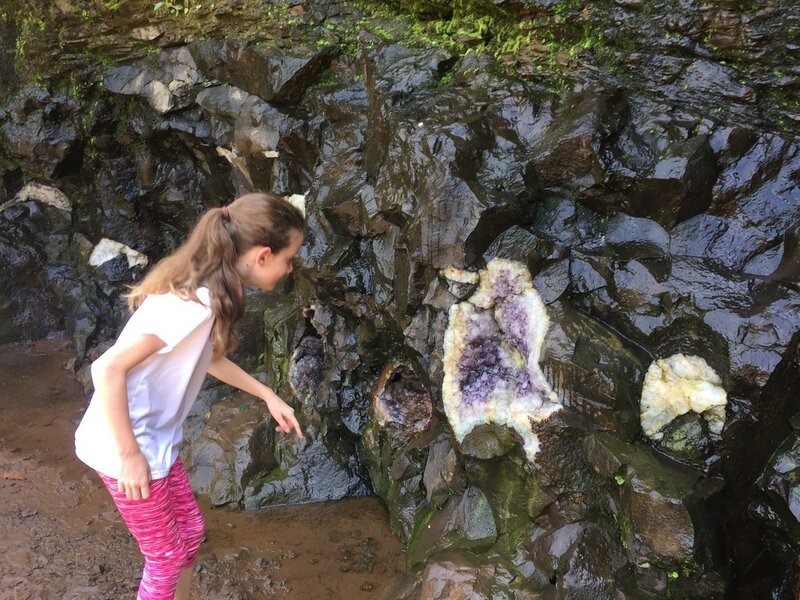 Two people discovered them and showed them to us. There was a mom, dad and the mom was holding a baby. We are in Casa Tiffany until Sunday and then we are going to Bocas del Toro in Panama. Last Friday night we went to go see wild sea turtles lay eggs. We went to Pirate Beach with a guide, who was a crazy driver, to look for turtles. Nelson had us sit on the beach waiting to see if any turtles would arrive. After about 30 minutes one was coming in! It was a Pacific green turtle. No one was allowed to have any lights on and we had to sit still and be quiet. She crawled up the sand just into the dry part which is where they like to dig their nests. We left her alone so that she could get settled. They are very picky and don't like to be disturbed until they are laying their eggs and then they go into a trance. As we were walking quietly down the beach another turtle was coming in and then another one and another one! Ryan counted nine turtle tracks by the time we left. 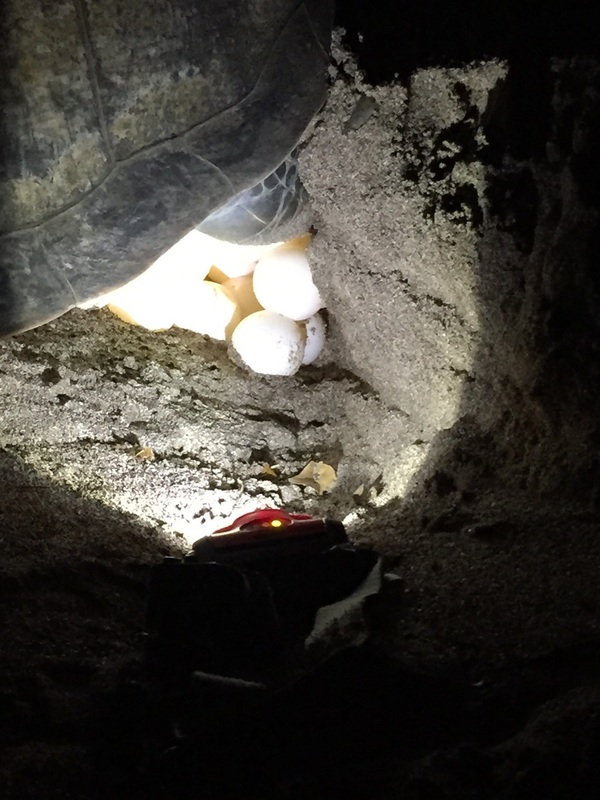 Our guide told us that one out of ten turtles decides to lay eggs that time of night. Many of them come back later. We were lucky enough to see one lay eggs! It was pretty cool! 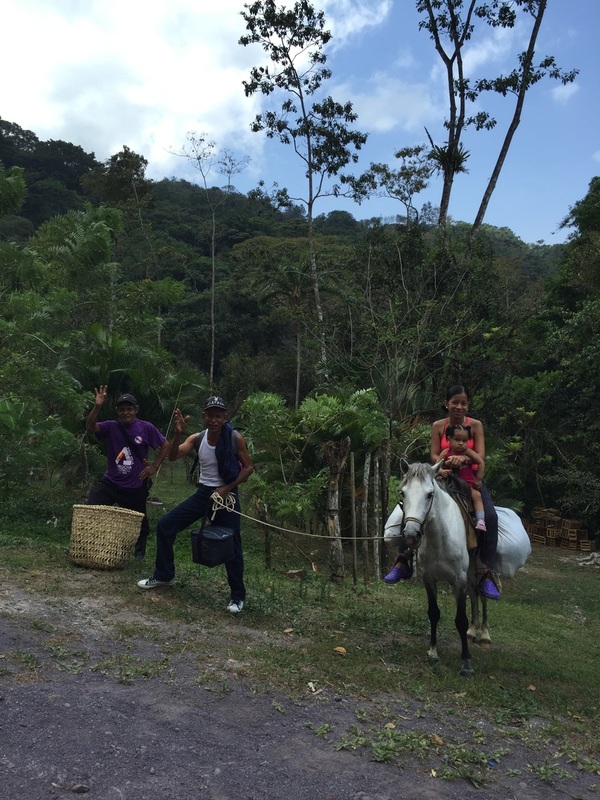 We left Playa Flamingo and headed to Lake Arenal. Arenal is a big volcano with a beautiful, wide and long lake. This area reminds us of New Zealand. 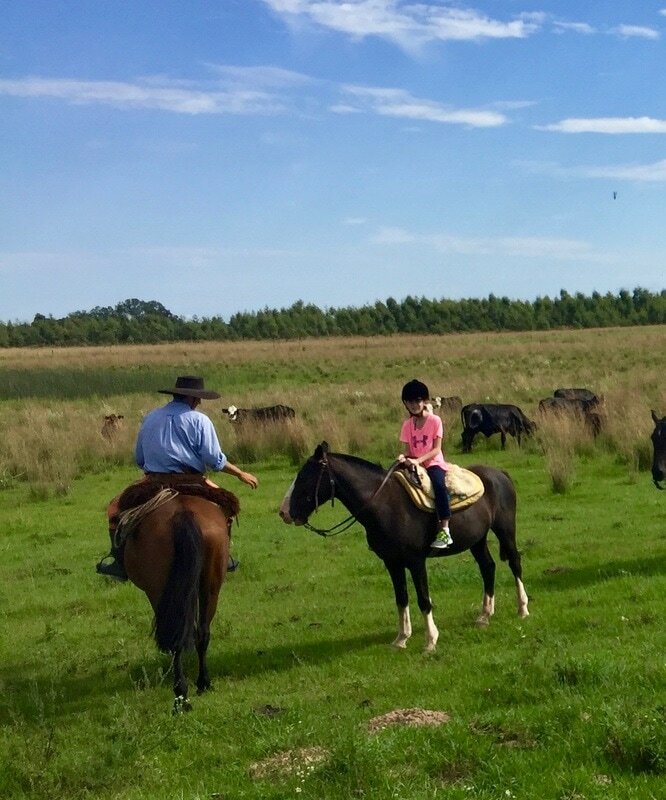 We stayed 2 nights at a horse farm and of course went horse back riding. 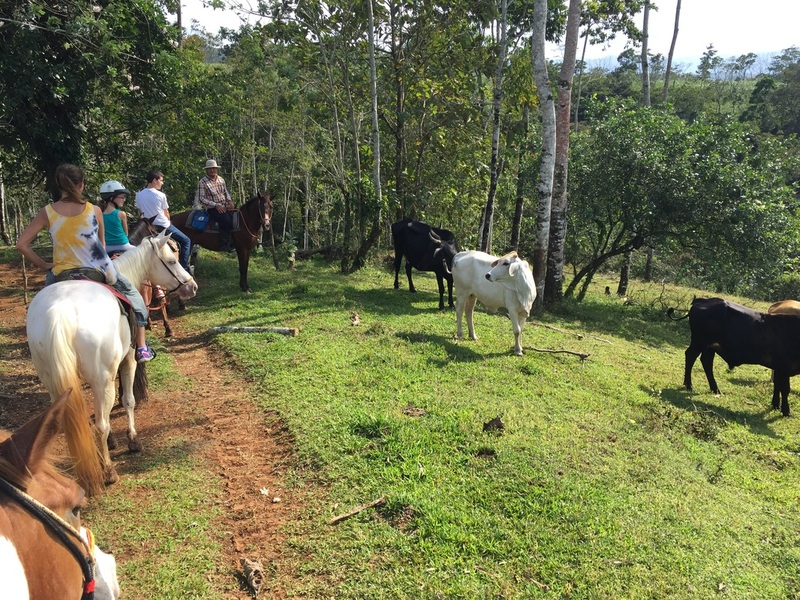 It was a little scary at first because we started by riding in a jungle which had deep mud, steep hills and we had to jump up a creek bank. 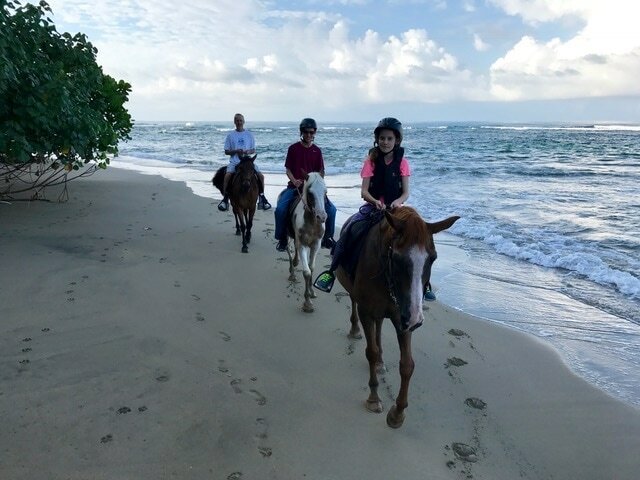 We rode for 3 hours through pineapple fields, sugar cane fields, cow pastures, country roads, the jungle and downstream a creek. It felt a lot longer than 3 hours! My buns are sore. Now we are staying at a house on a hill above Lake Arenal. Sweatshirt weather again! Our host Patrick is a very cook. He made us a huge breakfast this morning! 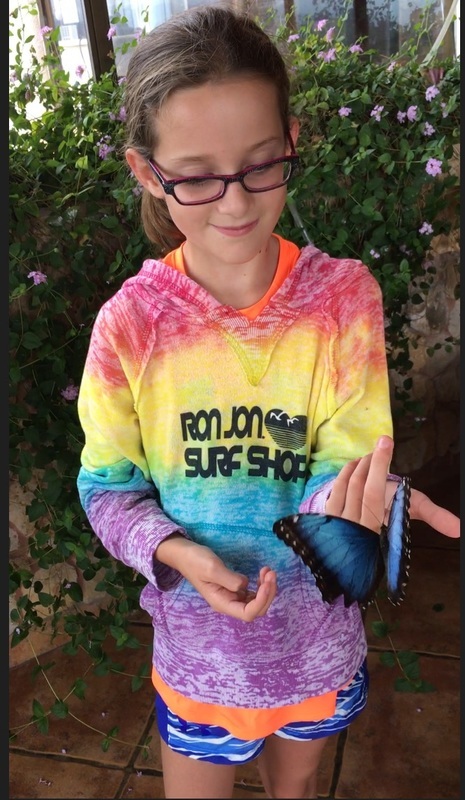 He brought in a blue morpho butterfly for us to see. Hi, I'm Kylie. I'm 11 years old. I love horses and art! I want to be a sucessful businesswoman when I grow up.